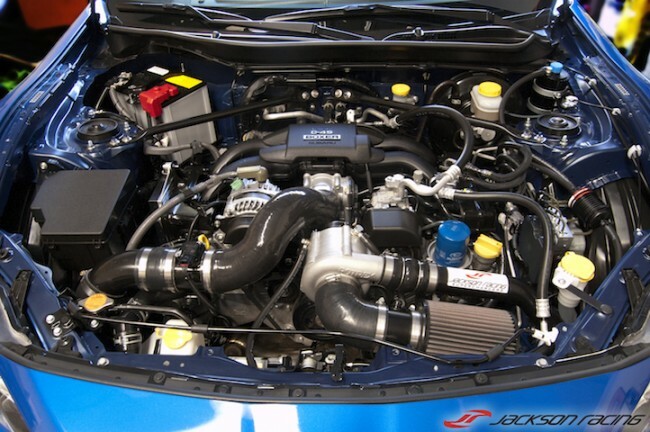 Yorba Linda, California (October 15, 2013) – World leading supercharger experts Jackson Racing are proud to announce their new supercharger system for the Scion FR-S & Subaru BRZ is now available from $3995USD. The Jackson Racing FR-S/BRZ supercharger system delivers an impressive 50% increase in HP and 45% increase in TQ over stock! The power and torque delivery of the Jackson Racing supercharger system gives the FR-S/BRZ the perfect balance of power and handling. The Rotrex C30-94 supercharger provides a strong and smooth power band, while also maintaining perfect drivability and excellent fuel economy. Also, the Jackson Racing intercooler system is unique in the FR-S/BRZ market and has been engineered for proper bolt-on fitment. The Jackson Racing FR-S/BRZ supercharger system has been extensively tested in all weather conditions to ensure factory drivability, excellent fuel economy, and proper emissions are retained while giving a substantial boost in performance. This includes not only the components in the system, but the Jackson Racing ECU calibration. The provided Jackson Racing ECU calibration is the product of hundreds of hours of dyno testing and thousands of miles of road and track testing. The Jackson Racing developed ECU calibration features proprietary tuning developments giving the supercharger system drivability equal to a factory vehicle. No hesitations, no hiccups, no band aids… Just a completely solid car. And just like our CARB-Legal CR-Z and Civic R18 systems, we are in process of getting the FR-S/BRZ system CARB-Legal! • Complete Bolt On System. No Grinding. The TIY system is ideal if you already have engine management and want to do your own tuning. This system would require customers to develop their own calibration at their local professional tuner. The Factory Tuned system is our full plug-n-play system. This system includes the EcuTek Programming Kit and our industry-leading Jackson Racing ECU calibration. No headaches, just install and enjoy! A: The Jackson Racing FR-S has done over 15,000 miles using the stock clutch, including track testing. If you have an aggressive style of driving we would recommend a clutch upgrade. Q: Will my FR-S/BRZ pass emissions? A: Our Factory Tuned FR-S/BRZ supercharger system is currently completing emissions lab testing and will be going through the CARB process, the same as all our previous CARB-Legal supercharger systems. Q: Will performance upgrades be available for the Jackson Racing FR-S/BRZ systems? A: Yes, we will be producing additional upgrades that can be added on to the current systems. Q: Will you offer a kit for Asian and European owners? A: International compatibility is being evaluated and will release shortly. Q: Will there be an Automatic Transmission system? A: Jackson Racing’s immediate focus is on the manual transmission FR-S/BRZ but we are evaluating the automatic transmission demand.